Add back support for the long haul! Rider backrests are special order items. RB-914: Smooth vinyl style. Add back support for long-haul riding comfort. Contoured backrest pad is shaped to provide full lower back support without pushing the rider forward, and the slim profile offers the passenger a few more inches of room. An adjustable support bracket with four mounting locations accommodates different seats and riding positions. The backrest pad angle can be adjusted for maximum comfort. Fits '88-later Touring models (except Trike) equipped with one-piece slotted seat. Installation requires separate purchase of model-specific Rider Backrest Kit. RB-900: Smooth style leahter. Add back support for long-haul riding comfort. Contoured backrest pad is shaped to provide full lower back support without pushing the rider forward, and the slim profile offers the passenger a few more inches of room. An adjustable support bracket with four mounting locations accommodates different seats and riding positions. The backrest pad angle can be adjusted for maximum comfort. Fits '88-later Touring models (except Trike) equipped with one-piece slotted seat. Installation requires separate purchase of model-specific Rider Backrest Kit. RB-583: Road King® Classic Style Rider Backrest Kit. Add back support for long-haul riding comfort. Contoured backrest pad is shaped to provide full lower back support without pushing the rider forward, and the slim profile offers the passenger a few more inches of room. An adjustable support bracket with four mounting locations accommodates different seats and riding positions. The backrest pad angle can be adjusted for maximum comfort. Fits '88-later Touring models (except Trike) equipped with one-piece slotted seat. 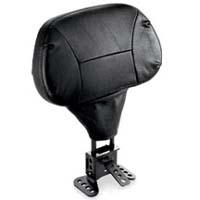 Installation requires separate purchase of model-specific Rider Backrest Kit. RB-530: Pillow-Look style. Add back support for long-haul riding comfort. Contoured backrest pad is shaped to provide full lower back support without pushing the rider forward, and the slim profile offers the passenger a few more inches of room. An adjustable support bracket with four mounting locations accommodates different seats and riding positions. 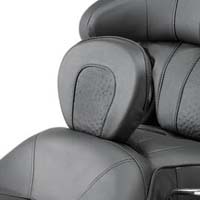 The backrest pad angle can be adjusted for maximum comfort. Fits '88-later Touring models (except Trike) equipped with one-piece slotted seat. Installation requires separate purchase of model-specific Rider Backrest Kit. RB-572: Comfort stitch style. Add back support for long-haul riding comfort. Contoured backrest pad is shaped to provide full lower back support without pushing the rider forward, and the slim profile offers the passenger a few more inches of room. An adjustable support bracket with four mounting locations accommodates different seats and riding positions. The backrest pad angle can be adjusted for maximum comfort. Fits '88-later Touring models (except Trike) equipped with one-piece slotted seat. 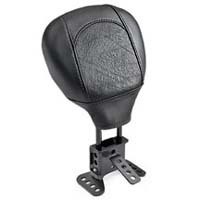 Installation requires separate purchase of model-specific Rider Backrest Mounting Kit. RB-6311: Street Glide models style. Add back support for long-haul riding comfort. Contoured backrest pad is shaped to provide full lower back support without pushing the rider forward, and the slim profile offers the passenger a few more inches of room. An adjustable support bracket with four mounting locations accommodates different seats and riding positions. The backrest pad angle can be adjusted for maximum comfort. Fits '88-later Touring models (except Trike) equipped with one-piece slotted seat. Installation requires separate purchase of model-specific Rider Backrest Mounting Kit. RB-564: '09 CVO Road Glide style. Add back support for long-haul riding comfort. Contoured backrest pad is shaped to provide full lower back support without pushing the rider forward, and the slim profile offers the passenger a few more inches of room. 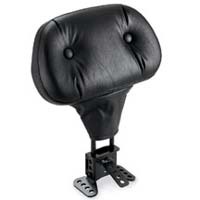 An adjustable support bracket with four mounting locations accommodates different seats and riding positions. The backrest pad angle can be adjusted for maximum comfort. Fits '88-later Touring models (except Trike) equipped with one-piece slotted seat. Installation requires separate purchase of model-specific Rider Backrest Kit. RB-719: Screaming Eagle Electra Glide with Ostrich insert. Styled to match the '06 CVO™ Ultra Classic® Electra Glide® and the Sun Ray® Heated Seat P/N 51718-06, this leather backrest with embossed ostrich pattern insert features an adjustable support bracket with four mounting hole locations to accommodate different riding positions. Backrest can be easily removed for storage in Tour-Pak® or saddlebag. Fits '97-'08 Touring models equipped with slotted seat. Also fits '88-'96 models with Original Equipment seats. Mounting Kits: Kit includes mounting bracket and all required installation hardware. Required to install above Rider Backrests. HW-87: Required to install rider backrest on '88-'08 Touring models. HW-89: Required to install rider backrest on '09-later Touring models (except Trike).